Most liquor cabinets are good. They tend to be filled with booze, which is a great starting point. 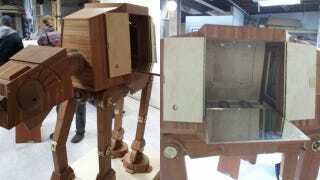 But this Imperial Walker cupboard should have your family simultaneously drunk and quoting Star Wars. What better? As far as I'm concerned, not a lot. The pedigree of this beast is somewhat of a mystery, though. The pictures appeared on Imgur earlier this week, but there's no word on who made the thing. Whoever did seemingly put a lot of time and effort into it, though, as it appears to stand 5 feet tall and be hand-made from wood and brass.